Exomes. Massive parallel sequencing technologies are ideally suited to identify the genetic basis of monogenic disorders, particularly recessive diseases. In a recent publication in the Orphanet Journal of Rare Disease, Abdel-Salam and collaborators identify a homozygous mutation in WWOX in a family with epileptic encephalopathy and neurodegeneration. Their study highlights the issues of how to interpret recessive gene findings spanning different phenotypes identified in the era of exome sequencing. Phenotype. Abdel-Salam and collaborators searched for the genetic basis of a presumably recessive neurodegenerative disorder in a consanguineous Egyptian family with two affected siblings. The disease manifested with developmental delay, primary microcephaly and onset of intractable seizures at 1 month of age. Seizures in both siblings increased to episodes of status epilepticus. One sibling had died in infancy from the disease prior to the study; exome sequencing was performed on the younger sister. The older sibling died from status epilepticus at the age of 16 months. MRI showed progressive atrophy with hypoplasia of the corpus callosum. During their short lives, neither sibling achieved major developmental milestones and both were severely delayed. WWOX. Performing exome sequencing in the younger sister, the authors identified 16 genes with functionally relevant homozygous mutation and focused on the WWOX gene, coding for the WW-domain containing oxidoreductase, which represents a tumor-suppressor gene that is frequently found to be mutated in squamous cell carcinoma. Recessive WWOX mutations were also recently identified in spinocerebellar ataxia type 12, a known neurodegenerative disorder that is also accompanied by intellectual disability and epilepsy with generalized tonic-clonic seizures. Synthesis. When I first learned about WWOX, I was not aware of the second publication describing mutations in this gene in spinocerebellar ataxia, and I am happy that I looked this up while writing this post. 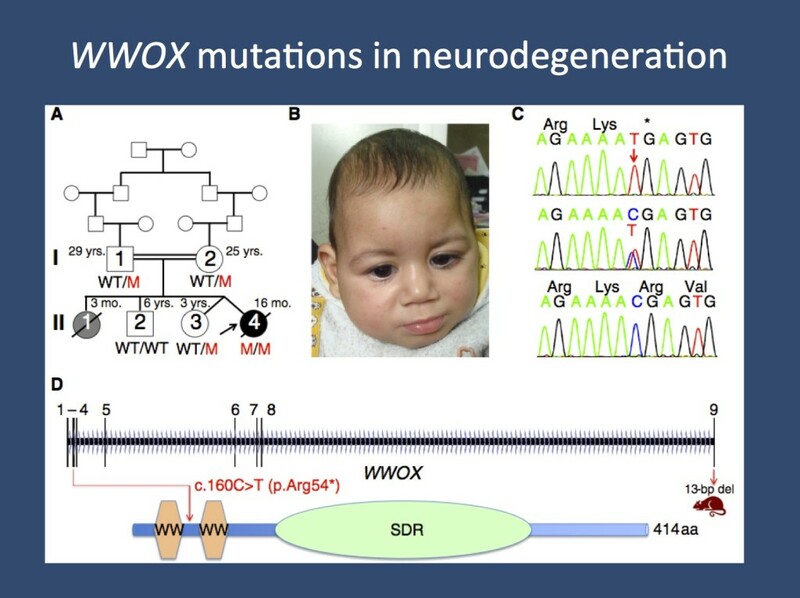 Taken together, both the publication by Abdel-Salam and collaborators and the publication on spinocerebellar ataxia by Mallaret and collaborators suggest that WWOX may be involved in group of recessive disorders that have epilepsy and neurodegeneration as presenting features. However, the severity of the phenotypes differs significantly. This suggests that the discovery of recessive disorders may be complicated by phenotypic heterogeneity. This heterogeneity might ultimately be a good thing, as it allows us to use data from different clinical fields to give us second hits to demonstrate that a newly identified gene affected by recessive mutations is causative. Flood. In the same way that we have become careful when interpreting de novo mutations, the analysis of recessive variants requires similar scrutiny. In parallel to the flood of rare variants in dominant diseases, the same applies to recessive variants. We need additional genetic evidence to demonstrate causality. The WWOX story suggests that the combination of genetic data from previously unconnected phenotypes may hold promise for future studies. This entry was posted in 2014, Epileptic encephalopathy, Familial epilepsies and tagged consanguinity, EFHC1, genomic noise, neurodegeneration, neurometabolic disorders, QARS, recessive mutations, spinocerebellar ataxia, validation, WWOX. Bookmark the permalink.